Owen Leonard Clements (subject of previous posts: see Owen Leonard Clements and the 4th Field Artillery and Owen Leonard Clements Drowned During Invasion of Mexico) was a son of Senie Burkhalter and Benjamin Franklin Clements. He grew up in the Ray City, GA vicinity and as a young man entered the U. S. Army. He was serving with Battery D, 4th Field Artillery Regiment in Texas on the Rio Grande in January of 1916 when he and several men in his unit were involved in an ‘unofficial’ invasion of Mexico. Clements drowned while crossing the Rio Grande. Here is another account of the incident. Owen Leonard Clements was among soldiers who crossed the Rio Grande in 1916. MERCEDES, Texas, January 26. – Four American soldiers are known to be dead and two others are missing as the result of the first armed invasion of Mexico by United States troops, which occurred at Progreso, seven miles southwest of Mercedes at 3:30 o’clock this afternoon. 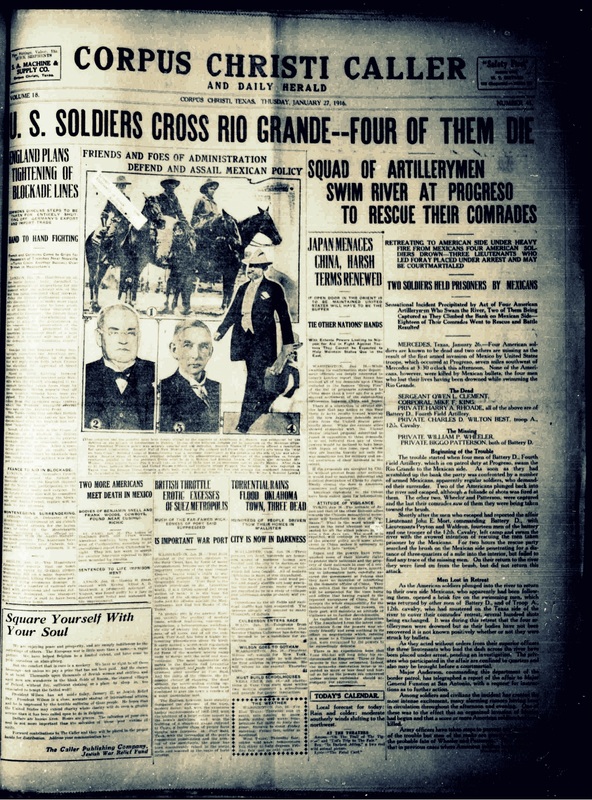 None of the Americans, however, were killed by Mexican bullets, the four who lost their lives having been drowned while swimming the Rio Grande. PRIVATE BIGGO PATTERSON, both of Battery D.
The trouble started when four men of Battery D., Fourth Field Artillery, which is on patrol duty at Progreso, swam the Rio Grande to the Mexican side. As soon as they had scrambled up the bank the party was confronted by a number of armed Mexicans, apparently regular soldiers, who demanded their surrender. Two of the Americans plunged back into the river and escaped, although a fulisade of shots was fired at them. The other two, Wheeler and Patterson, were captured and the last their comrades saw of them they were being taken toward the brush. Shortly after the men who escaped had reported the affair Lieutenant John E. Mort, commanding Battery D., with Lieutenants Peyton and Waldron, fourteen men of the battery and one trooper of the 12th Cavalry, left camp and swam the river with the avowed intention of rescuing the men taken prisoner by the Mexicans. For two hours the rescue party searched the brush on the Mexican side penetrating for a distance of three-quarters of a mile into the interior, but failed to find any trace of the missing men. On their return to the river they were fired on from the brush, but did not return this attack. As the American soldiers plunged into the river to return to their own side Mexicans, who apparently had been following them, opened a brisk fire on the swimming me, which was returned by other men of Battery D., and of Troop A., 12th cavalry, who had mustered on the Texas side of the river to cover their comrades’ retreat, several hundred shots being exchanged. It was during this retreat that the four artillerymen were drowned but as their bodies have not been recovered it is not known positively whether or not they were struck by bullets. As they acted without orders from their superior officers the three lieutenants who lead the dash across the river have been placed under arrest, pending an investigation. The privates who participated in the affair are confined to quarters and also may be brought before a courtmartial. Major Anderson, commanding this department of the border patrol, has telegraphed a report of the affair to Major General Funston at San Antonio, with a request for instructions as to further action. Among soldiers and civilians the incident has created the most intense excitement, many alarming rumors having been in circulation throughout the afternoon and evening. One of these was to the effect that an organized invasion of Mexico had begun and that a score or more American soldiers had been killed. hands of the Mexicans only their mutilated bodies having been recovered. “While American soldiers of Battery D, stationed at Progreso, were bathing in the Rio Grande river this afternoon two got too close to the Mexican side, were captured by Mexicans and taken into the interior. Four other American soldiers who went to their rescue were drowned.